-You can replace any other symbol, except (Scatter) to form the best combination of win. -It appears only on reels 2, 3 and 4. The expanded wild will only appear on 2nd, 3rd or 4th reels. -Expanded Wild will replace all the other symbol to form winning combinations before any prize payout. "Sparta" (scatter): "Sparta" (scatter) need not appear in any particular payline, it can appear on any position on the reel if there are two or more winning payout will be counted and multiplied by the total bet paylines wins. During the game, if there are three "Sparta" (scatter) or more appear anywhere on the reels, it will trigger the free games. 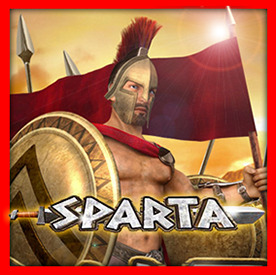 -Whenever 3 or more " Sparta " appear anywhere on the main game reels 15 Free Games with a multiplier of x2 are triggered. -Whenever 3 scatter appear anywhere on the Free Games reels, the Free Games round is retriggered, awarding 15 additional Free Games. -Automatically appears in rotation on reels 2, 3 and 4 during the feature. Gamble: Your goal is to pick a higher card than the dealer's. The dealer's card is open on the left. Correct picks pay even money.